How did the confusion begin? Where did the name 'Goji' come from? 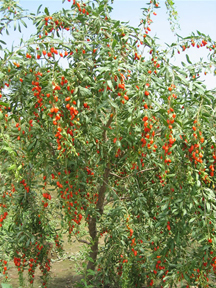 The Chinese Wolfberry is not a Tibetan Goji berry, although it is often sold under that name. In China there is no traditional or modern reference to the name 'Goji'. The name Goji is an extrapolation of a number of native words, and it was originally coined in 1973 by researchers at the Tanaduk Botanical Research Institute (TBRI). The first time the world learned of the word 'Goji' was at the time it was listed in 1977 on packaging for teas that contained Goji berries which were being sold at Tenzing Momo Apothecary in the Pike Place Market of Seattle, Washington. Mongraphs about this Tibetan Lycium called 'Goji' were written by researchers at Tanaduk Institute who later posted that information on the TBRI website. A number of things lead to the confusion between these two berries. First, the Tibetan Goji berry and the Chinese Wolfberry are both Lycium berries. They look similar to one another and share the same pinyin name of Gou Qi Zi. Sharing the same pinyin name causes great confusion. 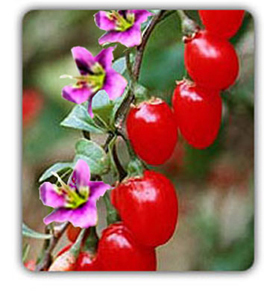 The Wolfberry (Lycium barbarum) has received much popularity in China. It is a widely cultivated export crop and highly regarded in China for its medicinal properties. In addition to being cultivated in the popular region of Ningxia, it is also cultivated on very large commercial farms in the regions of Hebei, Gansu, Qinghai, and Shanxi. Many varieties of Lycium berries grow all over the world, but the highly revered Tibetan Goji berry grows ONLY in some areas of Tibet and mostly in Mongolian areas. Wolfberries do not grow in any abundance in the traditional Himalayan botanical collection areas where Goji berries grow. Never in the past have Wolfberries been referred to as 'Goji' berries, or visa versa. That is until recently. Now that the Tibetan lycium 'Goji' berry has gained worldwide recognition with strong market demand, the much more cheaply cultivated Chinese Lycium barbarum, or Wolfberry, is being passed off as the Tibetan Goji berry. Another issue that has lead to confusion is the fact that in China, the Wolfberry is called Gou Qi Zi. People began to think that the name 'Goji' must be short for the Chinese name Gou Qi Zi; even though these two berries are different in size, taste, name and are grown in two different countries. The name 'Goji' only refers to the Tibetan Lycium variety of Lycium Chinensis. In addition to the confusion, several years ago a number of multi-level marketing (MLM) companies started marketing a product called Tibetan Goji juice and Himalayan Goji Juice. On the label it states it is made with Wolfberries: Chinese Lycium barbarum. Others then followed suit, using the MLM companies copied and rewritten material with additional spins and fabrications. Away it went. Soon dozens of companies used faulty information and began selling the Chinese berries as the Tibetan variety. Where do Goji berries grow? This special red berry is found growing wild in remote valleys and hillsides that traverse along green belt areas meandering between Tibet but mostly in Mongolia. This is where the best conditions exist for the production of the most nutrient-dense food on earth. The soil is usually alkaline (pH of 8.2 to 8.6) and very fertile. The temperatures get very cold and very hot (from 102 °F. to -16 °F.) This soil and climate produces the special, hardy Tibetan Goji berries that are small, plump, beautiful and famous. They are a deep red color with few seeds and an exquisitely sweet taste. What do Goji berries look and taste like? Whole, dried Goji berries are bright red and about the size of a raisin, but not quite as sweet as a raisin. Their flavor might be likened to a combination of cherries, dates, and raspberries. The vines of Goji plants often reach well over fifteen feet. The harsh climates in the traditional growing areas for Goji berries are partially responsible for the plants hardiness and potency. It can be likened to the way the highest antioxidant blueberries found in the US come from the harsh, yet rich and fertile climate of Alaska. Research done at New Brunswick Labs that extensively investigated blueberries grown in the US, showed a direct correlation between harsh climates and rich sources of antioxidants in the fruit. Because of these harsh climates the plants have increased nutrients that they need to be healthy and strong, and actually make more substances to protect themselves from harsh environments. Evidence shows that nutrients in Goji berries improve cell communication and have antioxidant as well as anti-inflammatory properties. These substances have been shown to increase mitochondrial function and detoxification. It has also been shown that nutrient dense foods such as Goji berries are far superior to supplementation with isolated nutrients contained in juices, capsules or tablets. Goji berries are found growing wild in remote, fertile valleys. They are naturally rich in antioxidant carotenoids, vitamin A, and Zeaxanthin. They contain B-complex vitamins, Vitamin C, and important polysaccharides. These special little berries contain more protein than whole wheat (they are 10% protein) and supply 18 different amino acids including all 8 essential amino acids. In addition, Goji berries are loaded with many phytonutrients. The Goji berry - Lycium Tibeticum/Chinensis variety is used in Tibetan Medicine to bring tonic and immune building strength to formulas that include other botanicals. Because of its neutral and sweet energetic properties it is suitable for use in many healing formulas that treat both hot and cold disease etiologies, and is also used as a food source both fresh and dried. The Chinese Lycium barbarum- wolfberry has an energetic nature that is hot, acrid and not suitable for use where heat conditions are prominent, or where weak spleen and weak digestion is evident. In Chinese medicine it is used only in combination with other herbs to harmonize the formula, it has never traditionally been used as a single food source. The foundations of wildcrafting methods, simple farming and a desire to preserve traditional Tibetan medicines, prompted Bradley Dobos, the director of the Tanaduk Botanical Research Institute of Tibetan Medicine, to take action. In conjunction with directors of His Holiness The Dalai Lama's Institute of Tibetan Medicine and Tibetan medical Lamas, he viewed the Tibetan Lycium, the 'Goji' berry, in a new light. Here was an opportunity to simultaneously reveal a great food source and to conserve as well as educate the public. In the mid seventies the Tibetan Medicinal Plant Conservation Program was created under the auspices of the Tanaduk Botanical Institute. 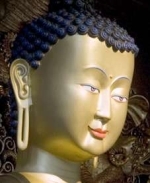 For almost thirty years it has been the aim of the Program to support Tibetan farmers, teach wildcrafting methods, raise global awareness of various indigenous flora, and shed light on the cultural significance assigned to them. This in turn is working to raise awareness and funds that help to preserve these endangered plants and traditions. When thinking about getting the berries into distribution supply lines for the world market a very thoughtful and protective distribution method arose out of concern for over popularity in the world market of a single botanical or group of botanicals. The Goji Farmers' Collective (a co-op) was created in 1974 by a group of Tibetan Medical Lamas and botanical researchers of The Tanaduk Institute to support these farmers and protect these ancient, wild growing areas. In turn, wildcrafting techniques were initiated to ensure sustainability and negotiate fair trade wages for the wildcrafters and farmers to help maintain these contracts for worldwide export of the Tibetan variety of Lycium berries. Tanaduk set up fair trade protocols before 'Fair Trade' was even conceived and is now getting into the mainstream. The Tibetan Goji Berry Company was created to be the authorized comptroller/supplier for the distribution of the authentic Goji berry from these ancient medicinal valleys and precious Goji growing regions. This single office will then be able to manage the distribution so that the traditional Tibetan clinic's Doctor (Amchi) and monastic medicine factories, who have been using these berries for many generations, will have their Lycium supplies first and the remainder is then made available to the world market. Because of this protective effort over harvesting is now not an issue with this Tibetan Lycium berry, as wildcrafting standards are well practiced and harvests and distribution well managed. The traditional Himalayan medical clinics that have been using these specific berries for medicines over the centuries will still always be getting the supplies they need every year as they are part of the distribution protection plan established by Tanaduk Institute, highly trained Tibetan medical Lamas and botanical conservationists. © 1991-2011 by Tanaduk Botanical Research Institute, L.L.C. This information, images and attachments may not be copied in whole or in part, forwarded or posted anywhere, without written permission from Tanaduk Botanical Research Institute.